Synopsis: Here is the story of a very noisy baby. She could bellow like a buffalo. And roar like a lion. And howl like a wolf for a very long time. The baby loves to make all kinds of sounds. She’s really very loud. But when some animals in the town go missing, can the very noisy baby help? Find out in this wonderfully boisterous story, full of action, fun (and noise!). If you already have a number of picture books by award-winning author and illustrator Alison Lester, who has been delighting Australian readers for years, you’ll no doubt be excited to add her latest offering to your collection. If, on the other hand, you haven’t read one of her titles before (and I know that’s unlikely! ), you’ll be in for a lovely surprise as you’re introduced to Lester’s iconic illustration style and clever text. 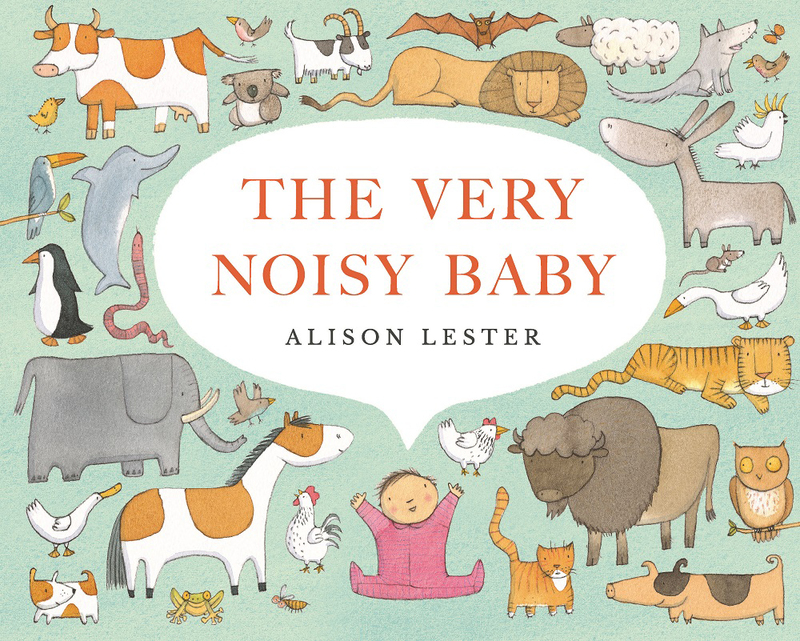 The Very Noisy Baby is perfect for young readers aged around three years and up. It’s a fun, truly engaging story full of wonderful rhythm and repetition, plus lots of rhyming parts, all of which will keep even the littlest listeners glued to their seat and giggling with glee. This picture book is a fantastic one to read aloud (for individuals and small to large groups), with lots of animal sounds to practice. In the story, various creatures go missing, and their owners, carers, or other interested parties go searching for them. Upon hearing relevant growling, howling, neighing and other sounds coming from a house, they think they’ve found what they’re searching for. But, as various occupants of the home come to the door, it’s discovered that a very noisy baby is making all the sounds! What adds an extra layer to the story is that the baby’s noises actually end up saving the day, and provide some clever suspense for the later section of the book. Children will be enthralled by the fun noises they can make to match each page spread, plus they’ll have the chance to guess which animal will pop up next. Furthermore, the story enables kids to learn about various creatures found in Australia, from those in zoos and on farms, through to some living in the wild (including less-frequently featured birds). With different family members opening the door throughout too, children get to see how families can be made up of numerous ages and generations. As always, Lester’s illustrations showcase her well-known artistic style. There is plenty of white space throughout, which ensures young readers won’t get overwhelmed by the details and that the pacing works well and each image pops. There are numerous soft colours on each spread too, plus each animal and character is distinctive and memorable, which should help children stay engaged as the story progresses. Another excellent feature of the design of the book is that there is quite a bit of repetition in how the illustrations are laid out throughout. This helps to teach younger readers about design and story structure. It also means little ones can really focus on discovering one creature and its physical features at a time. Please note: a complimentary copy of this book was provided by the publisher in return for an honest review.